[IMAGE 1 of 3] The ability of Pogonomymrex ants to carry excavated sand in their psammophores is well known and documented. But, despite a few vague references on the Web , we have not yet found any descriptions of these ants using this structure to gather and/or transport seeds in the wild, under natural conditions  (nor have we observed this behavior ourselves, prior to 6/22/10). 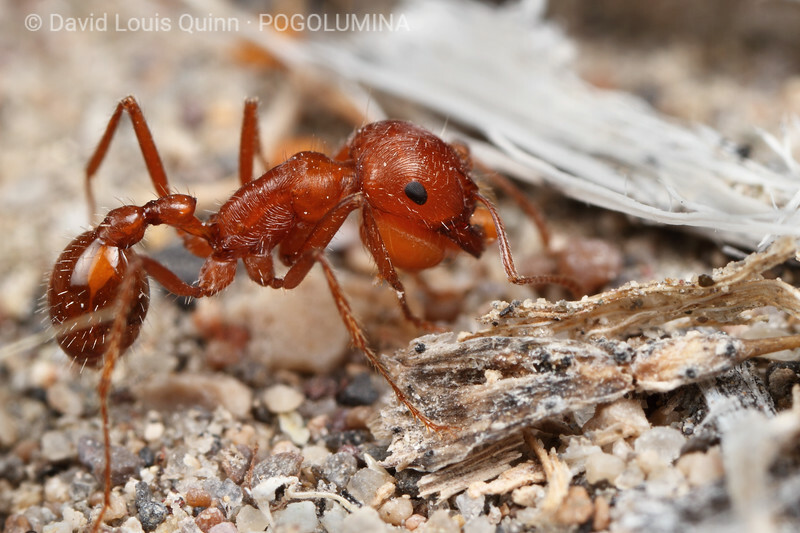 These Pogonomyrmex californicus workers were picking up (and transporting) multiple seeds of Descurainia sophia (a.k.a. flixweed). The nest of these ants was located in a sandy area, under a living Salsola (tumbleweed) plant - surrounded by many other plants including (and most abundantly) Descurainia sophia.